In a small bowl, combine the grill seasoning, lime zest, coriander, cumin and chili powder. Work the dry rub into the steaks on both sides; set the steaks on a plate and let stand for 15 minutes. In a small saucepan, melt the butter over medium heat. Whisk in the flour and cook for 1 minute. Add the milk and cook, whisking, until bubbling, 3-4 minutes. Stir in the cheese and chipotles in adobo sauce. Season the sauce with salt to taste. Reduce the heat to the lowest setting and keep the sauce warm. Drizzle a little EVOO on a large griddle or in a heavy skillet; spread the oil evenly with a bunched-up paper towel. Heat the pan over high heat until just smoking. Add the steaks and cook for 5 minutes, lowering the heat if needed. Flip and cook for 2-3 minutes for medium. Remove and let rest for 5 minutes. Slice the steaks and top with the chipotle-cheese sauce. Serve the avocados, tomatoes and red onion alongside the steaks. Sprinkle the salad with salt, lemon juice and EVOO. Top the steaks and salad with the cilantro. In Recipes-list.com we have selected the most viewed recipes from category - uncategorized . Enjoy the best recipes specially selected for you! 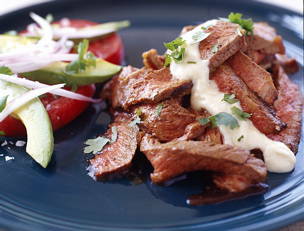 Mexican-Spiced Steak with Chipotle con Queso Sauce and Avocado Salad is the right choice that will satisfy all your claims.